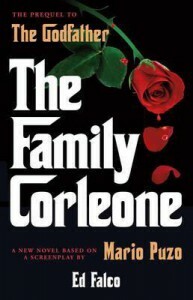 I only managed to get about half-way through The Family Corleone, mainly because there was very little going on. The parts that I read moved pretty much at a snail's pace and I was actually bored in the longer chapters. Also, the few more 'exciting' moments actually didn't phase me at all, since what had happened before was so dull. So little happened in the first half that once I managed to trudge my way through one of the longer chapters, I'd had enough and put the book back on my shelves. From the parts that I had read, there was only one thing that bugged me about the characters: there are so many new characters introduced that I didn't remember and didn't care for, that the Corleone family themselves are barely there at all. With these new characters, they are usually addressed by their full name and then given a nickname and then I completely forgot about them as soon as they left a scene. Once they came back, I was wondering who these people were. To me, the writing style seemed very similar to Mario Puzo's, but I haven't read any of Ed Falco's work so I don't think I'd be able to compare. For as far as I got, I think the writing style is probably the only good thing that I can say about the book since it did remind me of Mario Puzo's own writing style, because he had great descriptions and dialogue always sounded realistic. I wanted to like this book. I really did. I was really enthusiastic of returning to reading about Don Corleone and the family, but it just didn't turn out very well. I got as far as I could and very little had happened that I found interesting. Also, there were a slew of new characters who I easily forgot as soon as they left the page. I may return to this book some time in the future, but right now I'm unfortunately marking The Family Corleone as DNF.